This professional grade 54 inch aluminum pool fence is in stock and ready for immediate shipment! These three rail fully asembled six foot wide panels feature a pressed point picket between the mid and top rail. 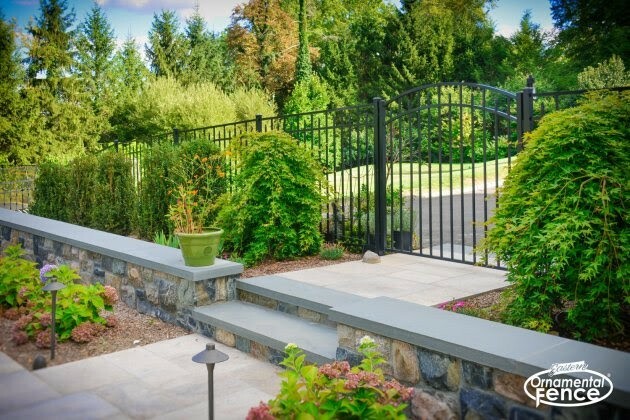 A favorite among those who enjoy the beauty and charm of traditonal wrought iron but want the ease of low maintenance aluminum. The powder coated finish is available in either black or bronze. Matching flat or arched top gates are available in either four or five foot widths. A free magna latch is included with every order over twenty five sections! Delivered the next day in the New York (Long Island, and the Hudson Valley), New Jersey, Connecticut and parts of Massachusetts and in most cases at no charge.